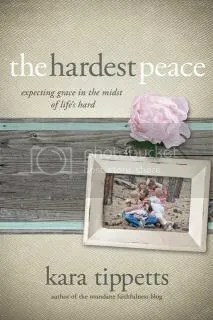 The Hardest Peace by Kara Tippetts is the latest book I’ve received from Litfuse for reviewing. And it’s almost hard to put this book into words. There are lots of books speaking about getting through hard times from pastors and such, who have walked with people, that sometimes seem like they offer solutions that are just don’t really help, that just seem too easy and too shallow. And there are lots of books from survivors… those on the other side of the darkness…. that are great for encouragement that there can be healing. Kara writes about her life in her struggle with cancer and dealing with the fact that she may well die from it… from in the middle of the struggle. From right in the center of the hard. From a place where she openly writes that she may not live to see the book published… and where she has to accept that there is a likelihood that her husband and young children will be carrying on with their lives without her, and bearing the hard of their loss. There are no cheap easy answers here… nor are there any false hopes. There’s no pretending that it’s easy…. or that faith and tears can’t coexist. It’s real, honest, and open… and I pretty much guarantee tears. And though my very hard place is completely different from her very hard place… I find it comforting to have the honesty and the openness… when so many seem to want to close the doors and hide the hard places from view. But Kara also shares the peace… that she is able to trust that whatever happens in her story, whether she lives or whatever she dies, that the story is good and beautiful. That there will be grace covering the story and those left behind even if things do not turn out as she wishes. It’s something that I know logically… but that’s frequently something I don’t always feel with my hard place. But it is truth. God is good, and the story will be the good story… always. Though my circumstances for tears are very different…. there’s a part that really stood out to me…. Having just finished reading the book, I don’t have the information yet that will go below this when I post it… and I’m somewhat scared to click over and see as to whether or not her comments about possibly not being here to see the book published ended up being her story or not. I don’t want to see the harder path chosen in her story any more than I want it chosen in mine. But with both of us… if that’s the path the story takes, it will still be the beautiful one. You can purchase your own copy at Mundane Faithfulness. Kara Tippetts and her husband, Jason, have four children and lead a church in Colorado Springs, Colorado. Cancer is only part of Kara’s story. Her real fight is to truly live while facing a crushing reality. Kara Tippetts‘ brave and touching book, The Hardest Peace is launching with a blogger challenge. Celebrate with Kara by joining the #HardestPeace conversation and share how you are finding grace in the midst of the everyday and in life’s hard moments. Unfortunately, there’s not much of it that I can really post openly. But, I know that I should respect it anyway. Let’s just say there was an incident. I took a lesser route, rather than the one that I should have to deal with the incident, because I knew he was passionately opposed to the route I should have taken and that I know others were considering taking, but he’s still mad at the route that I did take to prevent that. It got games started… dragging one of my friends into it… and then a backlash completely with threats that he doesn’t even have the legal standing to fulfill if he wanted to. So, another round of punishment for caring. Another round of wishing I didn’t care, because it would sure make my life a lot simpler and a lot less drama. And another round of wondering how to force myself not to care without it causing an avalanche from all the feelings I’d shoved aside forming a big pile. So, as I’d mentioned, I’d been talking a little bit with a couple of guys on the dating website. The third guy seemed to have some potential. There wasn’t really any deep emotional draw yet, but he had a job, seemed like he has his life mostly together, that sort of practical thing. He was divorced, had shared custody of his 4 year old which kept him somewhat limited on messages sometimes, but lived alone other than when his son was around. I’d been talking with him off and on for a while… nothing too deep or sensitive, just general chat… and he’d made no indications that he wanted to take things offline, but then, he did know about the limits on driving from the knee injury. Well, I’d started messaging a new guy, who seemed a bit weird… so I used google image search on his profile pic to see where else it was used. You’d be amazed how many people use the same profile pics for everything, and forget that google can search by image… which if it’s also used on a page that has your name, gives someone that info even if it isn’t on the site you are using to talk to them. So, the weirdish guy just had some goofy youtube comments and some foursquare checkins that came up. Nothing too odd. But while I already had it open, I decided to check the other guy. And I got to his google+ page, which gave me his last name. And so I ended up on his facebook page from that, even though the pics on it were slightly different… but still clearly him and his son. And on that page, were a lot of public posts. Including the one showing that he got married last month. That had a bunch of congrats messages on it, including ones with the same last name that I would assume would be relatives… and so would likely know if it was just a joke. And including posts on his page as recent as the day before that were made by his wife, that seemed to be friendly. And one just before the marriage that she’d tagged him in that mentioned he’d been approved for disability. He’d told me he worked full time at a certain place, and hadn’t mentioned any disabilities at all. Ok, so obviously that’s the end of the conversation with that guy, and he’s going to be completely blocked. Even if he just wants chatting, I have no need to get involved with anything with that much potential for being a mess when I’m not emotionally invested in doing so at all at this point. But I’m not quite sure if I should say anything. To him, or to his wife. On one hand, I would probably want to know that my guy was leading women into thinking he was available on dating sites, even if he was just chatting… just to be aware to for signs of more than chatting. But one of my friends pointed out… if she’s into him enough that she just married him a month ago, she’s probably not going to believe anything that can’t be proven yet, or maybe even if it could. And with me, it has just been general chatting. But he’s definitely been deceptive with me about his life situation. But… even better… when I went back to the name and city search results I’d done once I got the last name, it had also pulled up a public mugshot from an arrest for a probation violation… thus meaning there had been previous arrests for who knows what. And this had been the guy who seemed stable and like he had everything together! So I’m very glad that I didn’t end up emotionally involved with this guy. I actually have no reluctance in the least bit on blocking him completely. Sometimes adopting my daughter’s cats and becoming a crazy cat lady sometimes seems like a sane and sensible choice when compared to sorting stable guys from the ones who either don’t really want a relationship, or aren’t in a position right now to offer one even if they wanted to. The situation from Sunday is bugging me. I know I did the right thing by not getting caught up in the situation… I know it’s the best thing long run. But, it’s another round where the decision that seems to be best logically is polar opposite to when feels best in my heart. This seems to be the year for that. I’m trying to remind myself it was the right move… that they could have chosen to approach things differently and directly at any time in the process. But my heart still wonders. This morning has just been filled with feelings that something is off. I don’t know if it’s related to yesterday’s situation, or exactly what is up, or exactly how to make the feeling fade. But today just feels off. There’s been a situation going on all day, that part of me wants to jump all over, but that I know I have to stay out of it and let it run it’s course, even when I’m pretty sure I don’t like where it’s going. Then it’s just had added frustration of tasks I want to be able to do and can’t, or managed but taking 10 times as long and a whole heap of a lot more effort. The hibernation feeling is still very tempting. It pays the bills, but gives me more afternoon time to get things done. I’m not as tired or worn out. This is getting into busy spells, and this week has mostly been a full week… and I’m feeling the difference. Hopefully will also feel the difference in the paycheck. Actually, with "obamacare", insurance if I changed over to having benefits would probably make up a big chunk of the difference. No, it’s not something that will be a forever thing on staying 3/4, but for right now, I think I’m ok with it.